*We partnered with Flatout for this sponsored post, and we’ve been compensated for our time in working with their products, however all opinions are entirely our own. The thing about being super busy is that, by the time we get back home in the afternoon, we’re … well .. super hungry. Not just a little bit of tummy rumbling … I’m talking supremely hungry. Yeah, it’s easy to grab a bag of something and munch away. But how satisfied do you really feel after absentmindedly reaching into a bag 1,000 times? It’s not satisfying at all. Not one bit. Nope. In fact, it’s probably more of an oh-I-shouldn’t-have-eaten-all-that feeling. 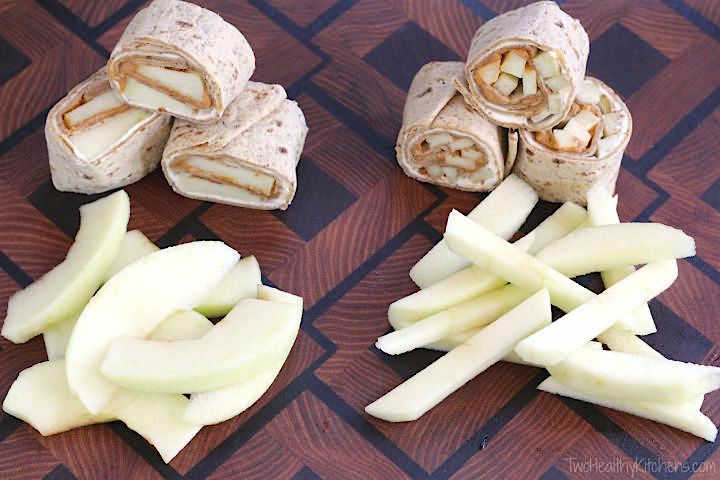 In our recipe directions, we suggest cutting the apples into long, thin matchstick-like strips, as you see on the right, mostly because they just roll up more nicely that way. But, if you need to throw these pinwheels together even faster, you can save a little chopping and simply use thin slices like we did at left. A snack that’s fun to eat … and easy to whip up … something the kids could even make themselves! And since life is so crazy, we need something we can take with us on to the next adventure (or cabinet maker, or flooring store, if you’re renovating your kitchen!). Something that’s portable and easy to eat, so we can be at gymnastics or lacrosse on time after running through the door to grab a leotard and cleats. 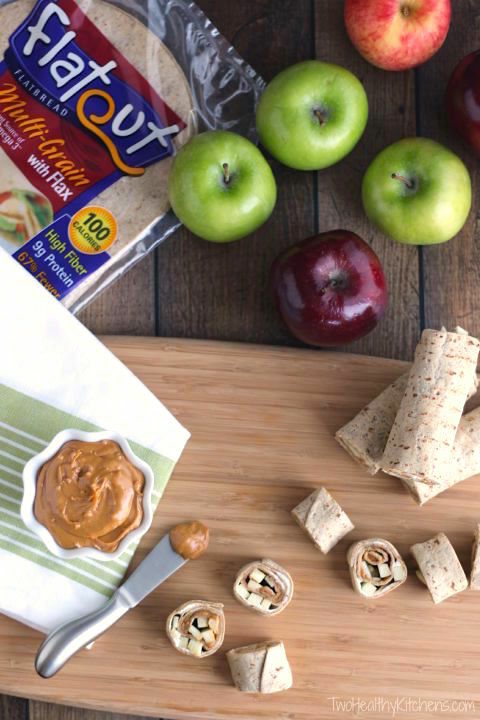 We’ve joined forces with Flatout Bread to create a deliciously satisfying answer to our snacking dilemma! 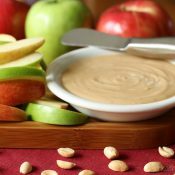 A healthy, yummy, really easy snack … perfect for those hectic days when you need to power up between lunch and dinner, or before a sports practice, or even as a mid-morning munchie! 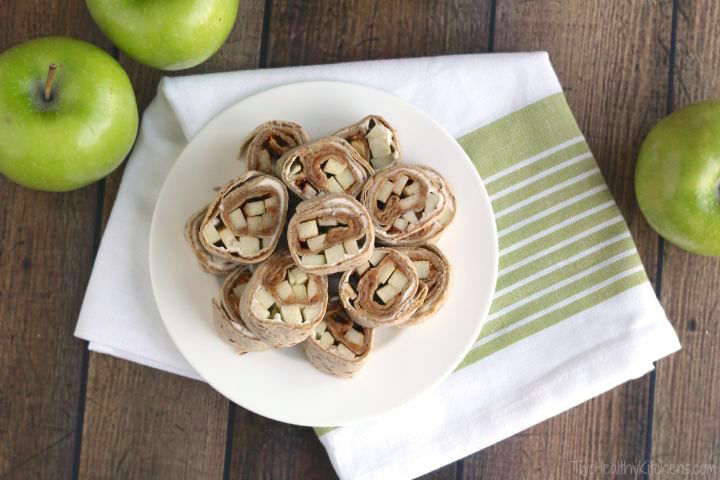 A quick spread of some nut-free butter and cream cheese, a handful of apples and a little sprinkle of cinnamon … then just roll it all up! And there’s definitely plenty of room for you and your kiddos to improvise … because, hey … Flatout is your canvas, so get creative! No cream cheese in the fridge? Double the nut-free butter! No nut allergy issues? Go for peanut butter if you’d like! 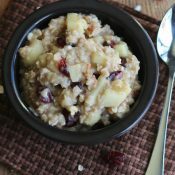 And your kiddos can try out other fruits, too, like fall pears or even bananas. This recipe is so adaptable, and your kids will have a blast concocting their own combinations! Flatout seriously makes snack-making simple. 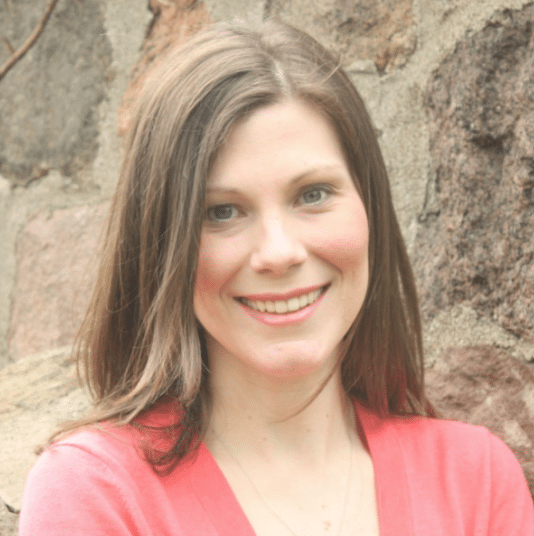 (Ahem … and meal-making, too … just sayin’!) We loooooove how versatile the Flatouts are, with sizes and shapes for every.single.occasion! For today’s recipe, I chose the Multi-Grain Flatout with Flax. Those teeny tiny flaxseeds pack a huge, nutritious punch! 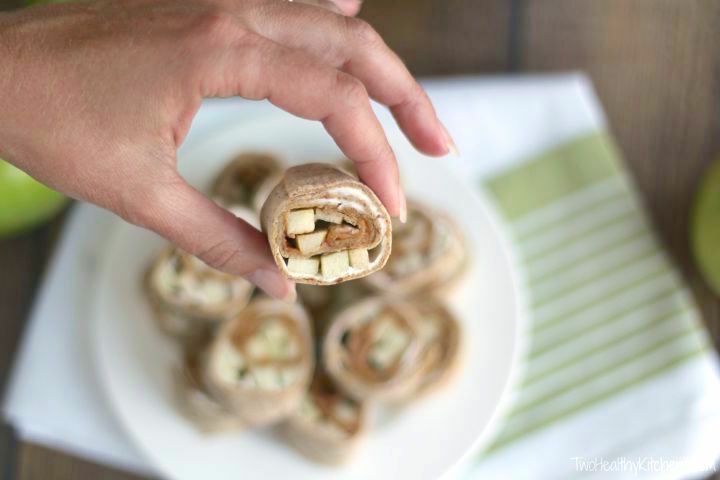 And the fact that they’re baked right into the wraps was a total bonus – that’s one less ingredient to add! But honestly, one of the terrific things about Flatout is how many of their products feature whole grains, lots of fiber and protein … so many nutritious benefits … that you can feel great about grabbing whatever Flatout looks good to you at the store (go crazy, friends … branch out!). The first time I whipped up this quick and amazingly simple recipe, I had a house full of contractors. My kitchen reno was in full swing. Those guys were working so hard, and I wanted to make a little snack for them. Since it’s fall (and I’m craving pumpkin and apple in everything! 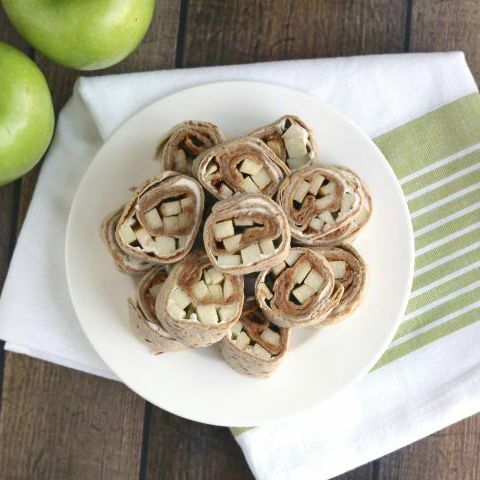 ), I chopped up some apples I had on hand, schmeared some crunchy, nut-free butter and cream cheese on a Multi-Grain Flatout, and added a sprinkling of cinnamon over the apples before rolling it all up and slicing it into bite-size rounds. Friends, I couldn’t make these fast enough. Every time I set out more, they vanished! Between mouthfuls, the contractors murmured things like, “My kids would love these!” and “It’s so good!” and “The cream cheese is awesome in there!” and “Mmmm … apples and cinnamon … like apple pie!” (Apple Pie, huh?!?!? Yup … we had our recipe name!) No, wait … it’s Apple Pie Cheesecake! Yes!! I’m not sure what happened when I mixed the cream cheese and nut-free butter together … but it was magical. Wow – with all that crazy-positive feedback (and all those pinwheels disappearing lightning fast! ), we knew we definitely had a winner here! So yummy, so quick and easy … the perfect pick-me-up energy boost when your belly is rumbling! And just a little note – we chose to use nut-free butter in this recipe. My youngest is allowed to take a morning snack to school, but all the classrooms are nut-free zones. Plus, we’ve noticed that, although the cafeterias in our district don’t ban nuts completely, all sports practices, snacks and classroom parties must be nut-free. So we opted for a nut-free soy butter in this recipe, but we also found that sunflower butter tastes great, too! And of course, if you’re not worried about nut allergies, you can go with good ol’ peanut butter. You’ve got options! Remember … it’s your canvas! Make it a masterpiece!! On one half of the Flatout flatbread, evenly spread nut-free butter. Spread reduced-fat cream cheese evenly on the other half of the flatbread. Place half of the chopped apples down the center of the nut-free butter, and the other half down the center of the reduced-fat cream cheese. Beginning with the side with the nut-free butter, roll towards the reduced-fat cream cheese side. With a sharp knife, carefully cut into 6 "pinwheel" rounds. Nut-Free Butter: We chose WowButter (a soy-based, nut-free product), but you could also substitute a nut-free sun butter (made from sunflower seeds). Alternately, if nut allergies aren't a concern, you can use regular peanut butter. 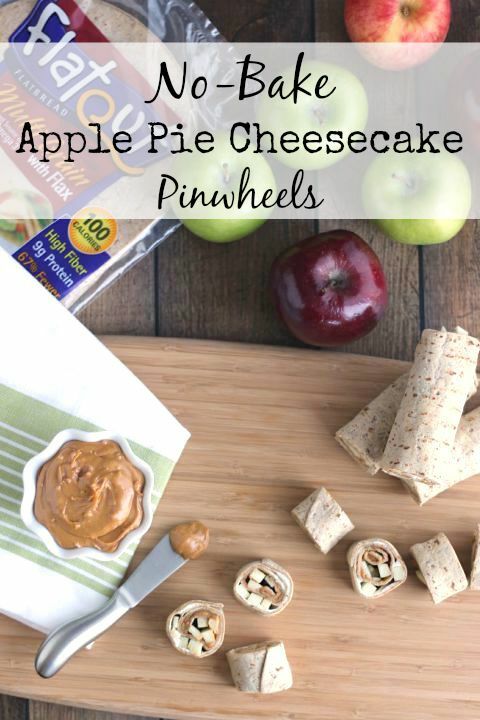 Make-Ahead Tip: These Apple Pie Cheesecake Pinwheels are a snap to make, and are a great snack for a classroom or team. 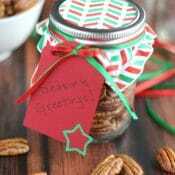 You can make these up to 24 hours in advance and store them in an airtight container in the refrigerator. Be sure to choose an apple that won't brown as quickly; Honeycrisp, Pink Lady and Granny Smith are a few great options. Wow, what an awesome idea! So fun, great healthy snack for both kids and adults! Wow what a fun idea. I could totally prep these and take them to work as healthy snacks. Those are great little afternoon snacks! I’ve never seen that bread before. I’ll have to keep an eye out for it! Oh Cynthia! Flatout Bread is awesome!! It’s packed with wholesome goodness with loads of complex carbs and protein!! You can make wraps, pizzas – and yes, pinwheels! – and so much more! These pinwheels were disappearing when I made a couple batches as my kitchen was being worked on! It was crazy how quickly they were gone! But then again, apple pie cheesecake = delicious!! Please enter our giveaway! You could win a box of Flatout Breads – what better way to sample them?! These pinwheels are so fun! Incredibly easy to whip up, too! 😀 So everyone’s happy!! Mmmm … it’s so yummy! Apple Pie Cheesecake should be eaten everyday! Lol!! What a fun and cute idea, love it!! These look like a great healthy snack. I might even be able to get my picky eater (my husband) to eat these! Ha! Thanks for the recipe and the giveaway! What a fun post! Yes, Justine! That’s brilliant!! Especially if you make these pinwheels with nut-free butter, you’ll not have to worry about peanut or tree nut allergies! This is perfect as a snack and also for my son to rake to school! These look SO good! I love that it’s kid-friendly, too! 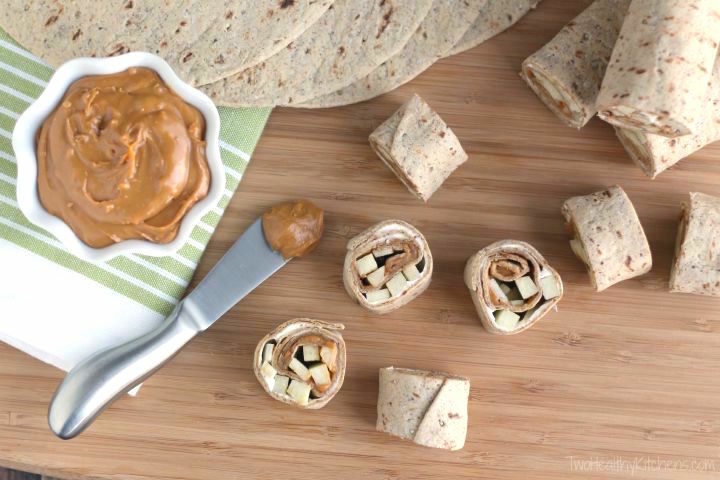 What an awesome twist on pinwheel snacks! This is such a cute idea! Great snack idea that anyone would love. What a fabulous idea for fall, I bet it tastes amazing! My kids would gobble these up! Great idea!!!! What a great way to get healthful snacks into everyone. Love the “nut free” butter. I have tried that and it’s delish. I make many varieties of Almond butter and would use that. What a creative and fun idea! My granddaughters will go crazy over these! My kids would totally love this! Thanks for the delicious idea! What a fun and appealing snack! I would love a plateful right now. haha oh gosh I definitely get haaangry in the afternoons before dinnertime! These pinwheels are so fun! And I love the flavor combo with the apples!! Oh girl – these are totally the snack for you!!! What is about the afternoons that makes everyone starve?! I hear ya!! I always need a little something, too!! What a great idea for the kiddos! My son also has a nut-free cafeteria so I love that you used an alternative! How perfectly awesome is this. My kids would love this on their lunch boxes. Thanks for the idea! This is the perfect after school snack. Love those Flatout wraps! The perfect after school snack!! So fun! 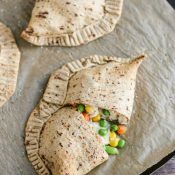 My kids would love making and eating these!